Space on-board ships is always at a premium, which makes Kaeser&apos;s new ESD rotary screw compressors ideal for marine use. 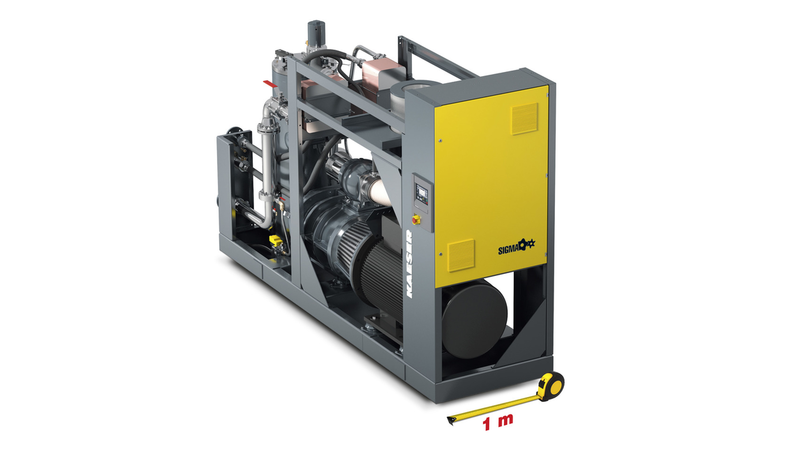 Measuring only a metre wide with a footprint of 3.52 square metres, they are significantly more compact than equivalent conventional compressors. Like all Kaeser compressors, they ensure outstanding dependability, power and efficiency. Reliability has always been a key requirement for any ships&apos; compressed air supply system, but so too is efficiency - especially in view of continuously rising energy prices. ESD compressors owe their exceptional efficiency and performance to meticulous engineering and design and save energy in four key ways: First, the airend in every unit features refined flow-optimised Sigma Profile rotors for superior efficiency. Second, Kaeser rotary screw airends are powered by IE3 drive motors for maximum performance and reliability. Third, Kaeser&apos;s highly efficient 1:1 drive design eliminates the transmission losses associated with gear or V-belt driven systems, as the motor directly drives the airend. The fourth major energy-saving feature is the newly developed PC-based Sigma Control 2 compressor controller which enables compressor performance to be precisely matched to actual air demand thereby allowing additional energy savings. Needless to say, this advanced controller is also certified for marine use. Ensuring that the compressor remains firmly in place no matter how high the seas, the system&apos;s stable base frame is especially designed to be bolted or welded to the ship&apos;s deck.